Once upon a time, when I was working at Johnson & Johnson (pharma branch), I was surrounded by a bunch of programmers working to develop (among other things) a nifty piece of software for internal use. Part of it was later released as freeware, called Vlaaivis. The main idea was to visualize each the compound’s many data at once, with each property being represented by a slice within the pie. For each property, ti was possible to define an ideal value, or range, and values above or below that one would show up as incomplete slices of two shades of the same color… This way, the fuller the pie the better, or more ‘dieal’, the compound under exam would be. You may find it still at its home, http://www.vlaaivis.com/. As I moved on to different things, I still remembered this as a good way of visualising multifactorial data, especially when comparing several candidates (compounds, in my case). Inspired by a post on LearnR, I decided to start reimplementing something similar in R for use within our own group. 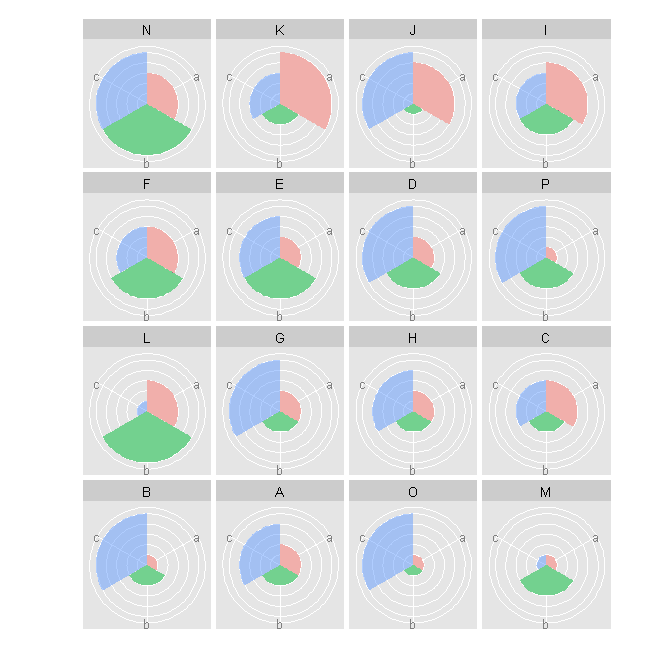 The most significant change from the LearnR post is that I added in a ‘facets_grid()’ call to the ggplot, so as to split the polar bar chart in the different compounds. Thanks to the faceting, all compounds are plotted on the same ‘space’ and are therefore immediately comparable. If, as I described previously, the bars were some kind of normalised score, such as the recently suggested druglikeness score, then the fuller the pie, the better looking the compound would be for a medicinal chemist. I omitted the legend, since the variable names (a-e) is present in each plot (does anyone know how can I get rid of the 0.5 legend key? it comes from the alpha definition in the ggplot). I’ll update this text and the code as I improve the visualization. Hope one or more of you find this useful!